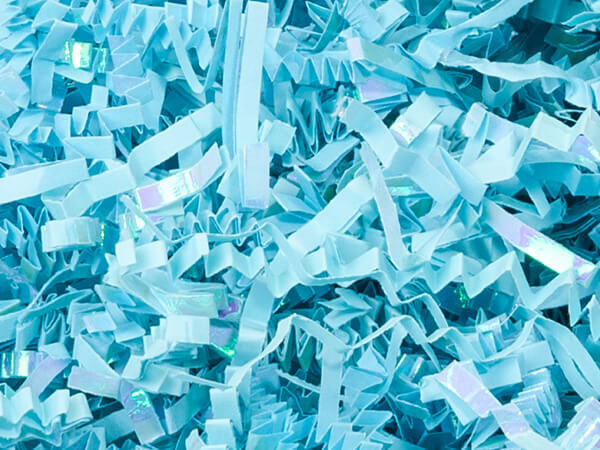 Laminate Light Blue Crinkle Cut™ Shred (Zig Fill) is perfect for adding shimmer to any arrangement! Actual shred size is 1/8". Shred is made of iridescent film laminated to paper.. Sold in 10 lb. cartons. Green Way® Eco-Friendly Packaging. Made in the USA. Note: Product ships as Dimensional Weight of 25 LBS due to volume of carton (18" x 11.25" x 23.5"). Product ships from separate warehouse via normal ground service, only to US destinations & cannot be expedited. Due to high Christmas sales volumes please allow 72 hours for order processing and shipment on normal orders. Large orders require additional time. Please call our customer care department for details 1-800-547-9727. Paper shred in vibrant and traditional colors is available in large, bulk 10 lb boxes and expands in volume. This strong shred is highly recommended for medium to heavy weight items. We offer these shreds in solid colors, metallic colors, iridescent colors and blends. Each shred is approximately 1/8" wide. for additional support. All of our paper shreds are made in the USA. Read our blog "Paper Shred: Good, Better & Best"